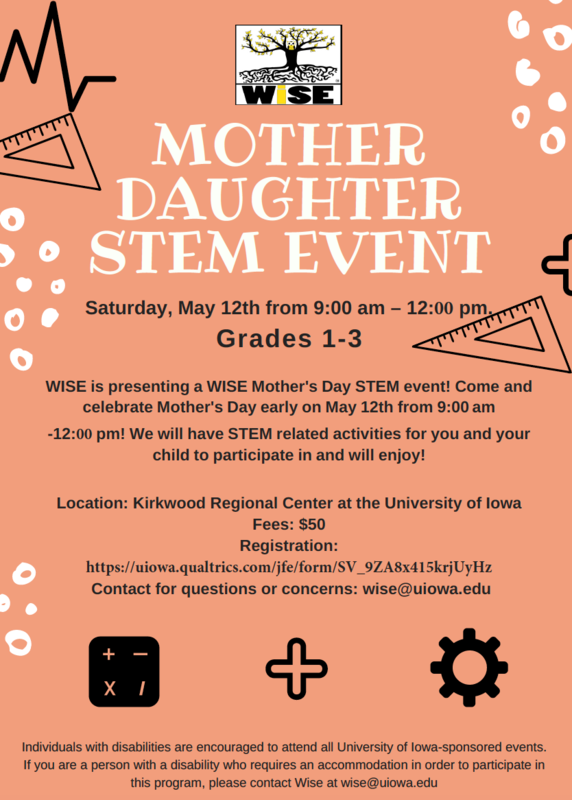 Description: The University of Iowa Women in Science and Engineering (WiSE) Outreach Program will be hosting a Mother/Daughter STEM event on Saturday, May 12th, from 9:00 a.m. to noon for 1st – 3rd grade girls and their mother (or aunt, grandmother, guardian,). Come explore the STEM of rainbows! July 23-26, 2018: WiSE PLTW STEM Summer Camp – Students entering 1st-2nd grade, 3rd-4th grade, and 5th-6th grade. Registration will open mid-April. September 9, 2018: Potential Grandparent/Granddaughter STEM Day – Grades K-2. Registration will open in August. February 10, 2019: WiSE STEM Extravaganza – Grades 4-6. Registration will open in January 2019. March 17–24, 2019: WiSE PLTW STEM Spring Break Camp – Grades 2-3 and 4-5. Registration will open in January 2019.